These are the words of the heavenly host who praised God on the occasion of Jesus's birth. As millions of Christians around the globe celebrate His birth today, I want to concentrate on the "bigger picture" that so many Believers do not see. Our Western culture is focused on the innocent baby born in the manger, and the message of "peace and good will toward men", which is an alternative interpretation of the last half of this verse. But I would like us to see that the appearance of God incarnate upon the earth is about more than the "peace and mercy" message put forth by those who choose to believe Christmas is a God ordained holiday. I don't mean to offend anyone -- the birth of our Savior as a gentle baby is truly a glorious phenomenon, but I do not believe it should be seen through the narrow lens of that single event. It is part of God's bigger plan, and this verse points us towards the crowning point and completion of His glorious mission. I believe that it is important for us to discern that in order for the Jesus of Christmas -- the baby born in a manger to a virgin mother; the birth that the angels on high celebrated and praised God for; the Christ child who is seen as the hope of the world for peace on earth -- in order for the Jesus of Luke, Chapter 2 to fulfill those promises and the hope of mankind, He must become the Jesus of Armageddon. Yes, an image of a sinless, blameless child takes the eyes of our spirit off our own sinfulness and the ugliness in the world for just a moment, and allows us to delight in warm, fuzzy feelings. But that image of our Lord is not a complete picture. That child came, ultimately, to grow up and confront Evil and Injustice, and to drive Sin off the face of the earth. I know that is not the picture that has been painted for us throughout our lifetimes. But it is the bigger Truth of who our Savior is and why He was born in the first place. We have lost sight of what Scripture is actually telling us in this chapter. 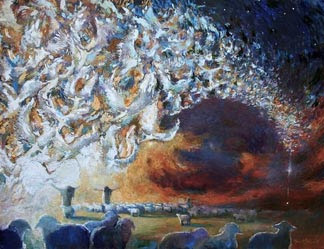 The previous verse in Luke reveals that "suddenly with the angel a multitude of the heavenly host praising God and saying Glory to God in the highest...". What we have perhaps forgotten, or at least need to realize, is that in the earliest Greek translations of the Bible, "heavenly host" refers to the army of heaven. "Host" is a military term connected with fighting and waging war. Not exactly the sentiment we attach to our celebration of Christmas, is it? But it is not too difficult for me to digest that God's heavenly army would be praising Him for setting His plan of redemption for mankind into motion. There is a battle in heaven for the souls and spirits of mankind, God's creation in His own image. And there will be a final battle on earth in which Jesus (God as man) will destroy His enemies and inaugurate His Millennial Kingdom on earth. And the birth of this baby is just the first step in accomplishing this plan, and worthy of the host of heaven proclaiming God's glory. You see, the angels singing the praise of God, here in Luke 2:14, know that this precious baby will grow up to be King of both Heaven and Earth! They are praising God because this baby will become a man who fulfills the plan for our salvation. He will grow up to be the advocate, the intercessor, the "one mediator between man and God, the man Christ Jesus." They are singing God's praises because this event is not the end of the story... the baby will grow up so that He could die, offering a perfect, sinless life in sacrifice for our sins... He will grow up to be raised from the dead, conquering death and instilling a living hope of eternal life in all who come to Him; in other words, "those with whom He is well-pleased". Don't get me wrong! I rejoice in the birth of our Lord. It shows God's great love for us, that He sent Himself to redeem us. But I do not believe we are to worship His immaculate birth as a festive holiday; as if the peace and joy we celebrate has already come. His birth does not accomplish that idyllic vision. True joy and peace will not become reality until Jesus returns at the end of the Tribulation, bringing with Him a heavenly host or "armies" from heaven to fight the final battle and rid the earth of the vestiges of Evil. I realize this is a more sobering picture of how you may see the Christmas holiday. But I am not trying to destroy your spirit of hope. Just recognize that Satan can deceive us by tempting us to idolize what God has not ordained. Just look at how the Bible treats Christ's birth, giving us scant details in only Matthew 1-2, and Luke 1-2. Yet the return of Christ to vanquish Evil from the earth is an overriding thread of hope throughout both Old and New Testaments. Enjoy the birth of our Savior today, but don't get so caught up in the false narrative of peace and joy that you can't see the big picture and what the purpose of this baby really is! Another excellent post! I tell people this too, but many just don't understand or want to hear it. Thanks again for all you do.